At the UC Hopland Research & Extension Center, 14 Mediterranean wine grape cultivars are being tested to see how fitting they may be for the North Coast. Using a randomized complete block ANOVA design with 8 replications of 5 vines for each cultivar, a total of 560 vines are in the process of being evaluated by Glenn McGourty, ANR-UCCE Winegrowing and Plant Science Advisor. These varieties have been selected from warm, sunny regions of the Mediterranean which have climates similar to the interior valleys of the North Coast, especially Mendocino & Lake Counties. The cultivars include Albarino, Cielegiolo, Counoise, Graciano, Nero d'Avola, Periquita, Sagrantino, Tannat, Teroldego, Tinta Amarella, Tinta Francisca, Tocai Friulano, Touriga nacional, and Vermentino. Some varieties are already showing verasian (changing of berry color) which means that the BRIX (sugar) levels are beginning to rise. With this change comes the attractiveness to birds such as European Starlings. Because of the array of ripening times dependent upon grape variety, the "harvest time" for the small research block may range over 4 to 8 weeks. Since the data gathered includes harvest data like berry counts, bunches per vines, total crop weights, etc. it is imperative that the crop be protected from damage by birds and animals. 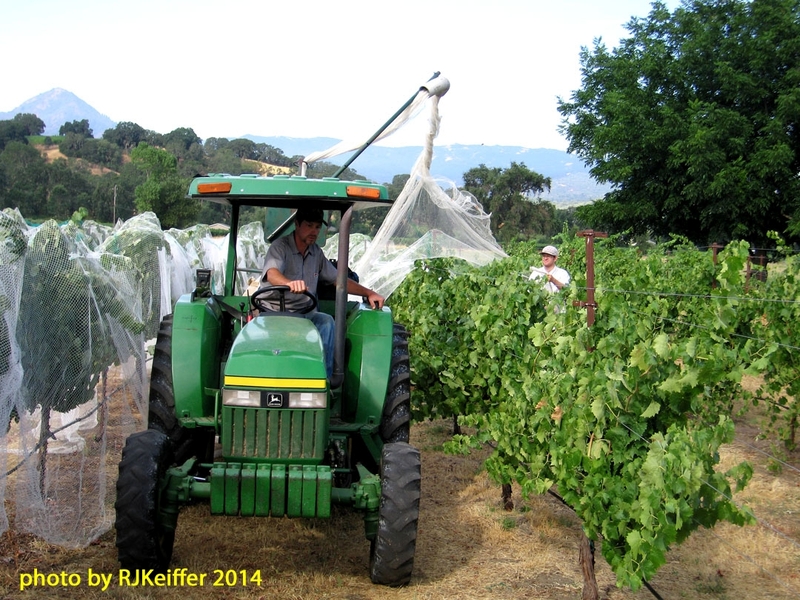 Here you see the protection netting being applied to the vineyard rows which went on last week.